What is Singapore Maths Academy? Singapore Maths Academy is a unique tuition centre which uses the world’s leading pedagogy (style of teaching) to deliver outstanding maths lessons. We are the first tuition centre which has an emphasis on the Singapore approach to mastering mathematics and hence we are a Maths specialist tuition centre. We use key principals found in the Singapore curriculum and which has led to Singapore being the leading nation in the world for Mathematics. Seeing the maths is a major part of our ethos. We use hands on learning to see concepts before moving onto the abstract. Problem Solving is at the heart of our tuition centre. We are experts at giving our students unique and effective visual strategies which have not been seen in the UK. We believe your child can be a master at problem solving with our programme. We have regular mental maths assessment which are tracked and embed mental maths in our lessons throughout Primary and Secondary phases. By following our programme we are confident your child will be able to visualise, understand and articulate maths like never before. We encourage students to see different ways of seeing maths and not just one way. We have a philosophy where we believe it is better for children to know five ways (not literally) to answer one question rather than one way to answer five questions. Singapore have been the leading nation in Maths for over three decades. The style of teaching, visualisation and focus on problem solving means that students enjoy and understand maths. Students are then given amazingly effective strategiesto solve complex word problems which seems easy as the strategies support visual understanding of even the most complex problems. 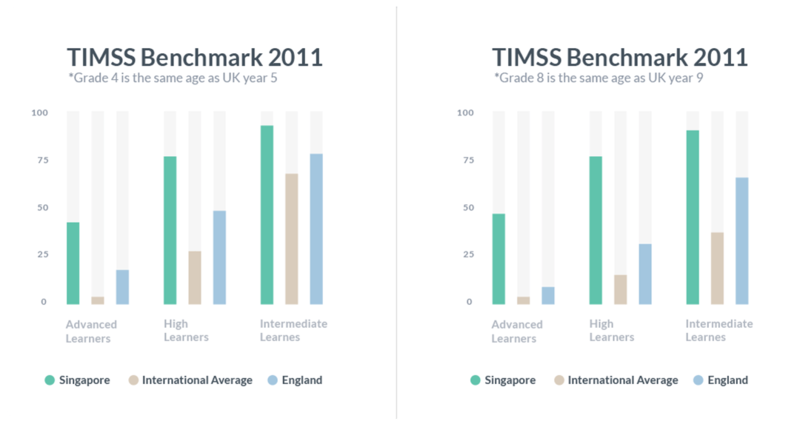 The following graphs show how Singapore compares to England in the most recent international benchmark, TIMSS (Trends in International Maths and Science Studies). Typically, by the time a child in England Is in Year 9, they are already 3 years behind children in Singapore.